The Right RV Satellite TV Antenna for YOU. 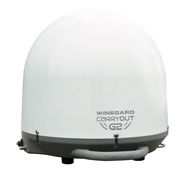 Satellite TV Provider Automatic or Manual In-Motion or Stationary Mount type Winegard model . If you already subscribe to satellite TV and are using satellite TV at home, you will be able to take your receiver with you to use with your mobile satellite TV antenna when you hit the road. Therefore, you will need to choose a mobile satellite TV antenna that will be compatible with and deliver all the programming you wish to take with you. If you are not currently a satellite TV subscriber, you will first want to select a provider and then choose a compatible mobile system.